"And when the heck was I going to stop asking questions and do something useful? So asks Kendra Ballantyne as she goes about solving the mystery of pet-nabbed pets while she takes care of a host of other animals and also works as a lawyer and conflict resolver. 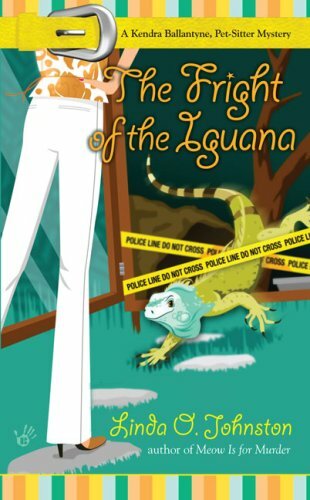 This is from Linda O. Johnston's newest book in her Pet Sitter Mystery series featuring Kendra Ballantyne - The Fright of the Iguana. Dogs and cats and an iguana have disappeared while under the care of members of the Petsitters Club of Southern California. Two of Kendra's charges, a 3-foot iguana and a Sharpei pup, have disappeared from the property of their owner, a high profile Hollywood film producer. Kendra is frantic to find the pets and soon discovers that other petsitters have had similar experiences - disappearing animals under their care. When one of the petsitters is found killed in one of the homes, things begin to get very serious. The plot of the novel is clever and the sub plots are entertaining as well as informative. Conflict resolution in the legal world, the business of petsitting and pet daycare, and interesting characters made this an enjoyable cozy. Found a list of mystery books with a Garden theme that I had made some time ago after scrolling through the web. Most I haven't read, but they might be worth a look. *The Hanging Garden by John Sherwood (have read most of his books and recommend them). 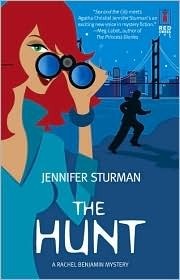 Set in San Francisco, a mystery by Jennifer Sturman, The Hunt, is the fourth Rachel Benjamim mystery novel, published in 2007. It involves a series of puzzles that the main character Rachel and her friends must race against time to decipher if they are to find their missing journalist pal, Hilary. Hilary had been last seen with The Igster, nickname for a former classmate who has made it big in Silicon Valley and who is on his way to becoming a billionaire with a new software. Hilary may have found a flaw in this software, however, and is planning a major story to reveal this fatal flaw. Motive for murder? Rachel and her pals think so after Hilary disappears and sends them an SOS text message suggesting she is in danger. A very enjoyable book with an interesting, witty, and somewhat unconventional main character, Rachel would rather follow puzzles and clues to find her friend than pick out crystal and plate settings with her future mother-in-law, or play tennis with her fiance's friends. The Hunt could be considered Chick Lit Mystery, a new and burgeoning genre in the mystery field, except for Rachel's unconventional tastes. Though she carries a Blackberry and mixes with people in high finance and in the computer and public relations business, she considers herself odd in a world full of "normal" people. There are no bodies in this mystery, but lots of clues and of course, affairs of the heart, to add romance to the mystery mix. Wearing colorful Christmas sweaters at this time of year seemed to be a bone of contention for an editorial writer in the new mystery, Grave Apparel by Ellen Byerrum. Someone disliked the writer's column dissing merry Christmas clothing so much, he clobbered her with a giant candycane just before an office holiday party, leaving her unconscious with a head injury and dressed in ...you guessed it, a jingling Christmas sweater! 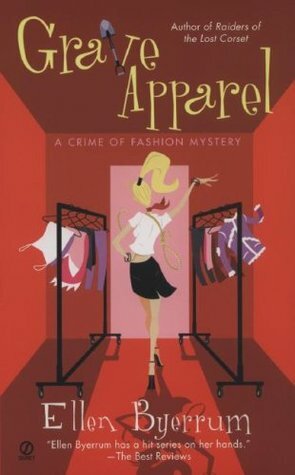 Fashion writer Lacey Smithsonian tries to find out whodunnit in this Crime of Fashion "Sweatergate" mystery set in Washington D.C. Too humourous to be a traditional cozy, this mystery seems to be all about fashion Scrooges and fashion tastes. 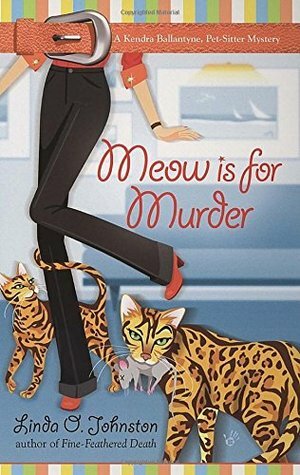 Finished that cozy mystery, Meow is for Murder, and couldn't have guessed ahead of time the person who "dunnit" or how those two Bengal cats were used to find the murderer. Clever little plot, although the deal that petsitter and lawyer Kendra makes with a suspect is unusual and somewhat unrealistic, I thought. The suspect, Amanda, is charged with the murder of man who has been stalking her. Amanda is the ex-wife of Kendra's current love, Jeff, and a bit of a stalker herself, always showing up at Jeff's door with various and sundry requests for help and assistance. She promises to stay out of Jeff's life for good if Kendra, an amateur sleuth on top of everything else, will find the real killer and get her off the murder hook. Here's the weird part. Amanda signs a "legal" and "binding" document saying she will be out of Jeff's life forever if Kendra proves her innocent. In the end, Kendra finds that Jeff may not have been worth all the trouble after all and accepts a date with, here it comes....., a vet that she meets on one of her other lawyerly cases. Now, like so many of the mystery heroines these days, such as Stephanie Plum in Janet Evanovich's books, this main characer has two love interests to add sauce to the mystery. Catch Kendra in the next book in the series to see how the new guy works out. That's how the mystery series sometimes works - a thread of romantic intrigue leads you on to the next book. Curiousity doesn't always kill the cat, but it sure makes some writers Fat Cats. A student from China arrives in London for a year's study of English so she can return home and help her parents with their expanding shoe factory business. Zhuang is 23 and a reluctant student, who nevertheless carries around a Concise Chinese-English Dictionary and looks up and writes down almost every new word she comes across for the entire year in London. A Concise Chinese-English Dictionary for Lovers, a new novel by Chinese writer Xiaoulu Guo, takes us in the heart and mind of a foreign student suddenly exposed to a strange culture. 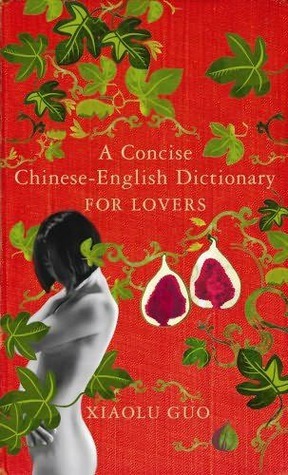 The student Zhuang tries to understand all the inconsistencies and contradictions of her new surroundings and the paradoxes of the English language as well. She must also deal with her newfound sexual freedom and her relationship with an Englishman she meets and falls in love with but who is her opposite in many ways. Though they live together for almost the entire year, they remain very different. More Buddhist in his outlook on life, he finds her need for commitment and security too demanding and unnecessary. She, on the other hand, is frustrated by his apparent lack of concern for the future. At the end of the year, Zhuang's student visa is not renewed, and she returns to China while her lover moves to Wales, a place he finds restful and peaceful but which she had found beautiful but cold, rainy, and gloomy. I recommend the book for anyone interested in East versus West perspectives. 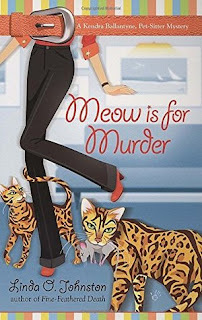 I'm reading Meow Is for Murder, a pet sitter mystery with a ball python named Pythagoras and a dog called Stromboli, not to mention two Bengal cats cutely named Cherise and Carnie. I noticed that the author, Linda O. Johnston resembles another pet mystery writer, Laurien Berenson, whose latest mystery, Hounded to Death, I've just finished. These two writers could be sisters or even twins, I thought. They both have the same kind of hair, same length, and style, and their features are similar. One parts her hair on the right, the other on the left, however. One wears glasses, the other doesn't. Well, I don't think they are the same person, writing under pseudonyms as some writers are wont to do. Besides, one likes King Charles Spaniels and lives in California, and the other loves poodles and writes in Kentucky. Their writing styles are also different. Both authors however have a great time creating zany or colorful characters to move their mystery plots along - one about pet sitting two Bengal cats, the other about dog show personalities and a dog show symposium. Both involve murder, of course. And, naturally, the pets are not among the guilty parties. 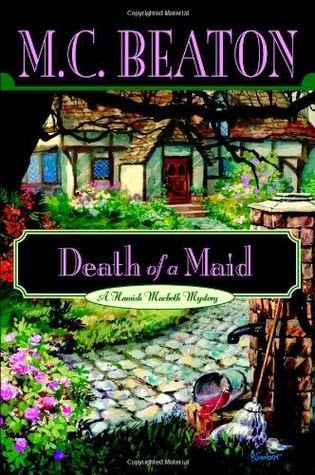 Death of A Maid by M. C. Beaton, another in the Hamish McBeth "Cozy"series that features the adventures of a quirky Scottish policeman in a small Highland village. A light mystery novel? I recommend it. The mystery of a maid "done in" is the latest that Hamish the policeman must solve, looking for anyone with "means, motive, and opportunity." And the motive for murder is a popular one in British cozies - blackmail. But which of the ones being blackmailed did the dirty deed. The popularity of the series lies as much in the plots, I think, as with the pictureque Highland setting and the character of the policeman himself. In every book in the series, Hamish sidesteps being drawn into marriage by a girlfriend or pushed into the arms of someone by the villagers who want to see him happily married. He also avoids notoriety, letting his boss take the credit for all the crimes he solves, and avoiding promotion and being sent from the quiet of his beloved village. Hamish's quirkiness endears him to his readers. He likes living alone with his wild lynx-like cat, his dog, and the sheep and hens he raises in his backyard. He has a perfect view of the ocean and the rough landscape from his living quarters in the police station. And he is known and liked by just about everyone in the village and the nearby towns. Thr maid in question is not missed by many, even by those she works for. But Hamish solves the crime, once again removes an offender from the village scene, and sends the perpetrator off to prison elsewhere. At the end of each novel, peace descends again on the village, thanks to Hamish. As it should, in a Cozy mystery. Finished reading Beaton's Death of a Gentle Lady, again with Constable Hamish Macbeth of the Scottish highland village of Lochdubh (fictional). Hamish tries to help save his police station and a Russian maid by proposing marriage, with grave consequences. Marriage eludes the policeman once again, though he does solve two or three murders. Who's Kitten Who? (Reigning Dogs and Cats Mystery) by Cynthia Baxter, December 2007. Long Island veterinarian Jessica Popper is more than busy. Not only is she visiting clients in her mobile clinic, which she refers to as her "clinic-on-wheels," and hosting a segment of Pet People on local TV, but she has to fit in the plans of several other people. Betty has joined, and whose body was found stuffed in a trunk in a dressing room in the theater. When one of the actors decides to leave the play after the murder, Jessica is offered a small part. As a member of the group, she is now in a position to observe and interview all the cast members, the prime suspects in the murder. .
Jessica has other things to worry about as well. She is to be the maid of honor at Betty's wedding and also has to prepare for the visit of her fiance's parents. Nick's parents bring their pampered little dog Mitzi and stays with Jessica and Nick in their tiny cottage, already filled with Jessica's pets - two dogs, two cats, a talkative parrot, plus a Jackson's chameleon. To make matters worse for Jessica, Nick objects to her detecting and her other activities, which he says take too much time away from him. Newsday reporter Forrester Sloan tries to step into Nick's shoes and into Jessica's love life while helping her in her detecting. Police lieutenant Anthony Falcone tries to discourage Jessica at every turn from interfering in the murder investigation. In the end, after several scary moments and at least one attempt on her life, Jessica does find the killer and manages to also smooth out her personal life. We learn a lot about theater production as well, as we follow Jessica through her rehearsals, her costume and make up sessions, and her observations on how complex lighting and scenery add to the success of a play. Witty dialogue and interesting sub-plots make this an enjoyable, "cozy" read. 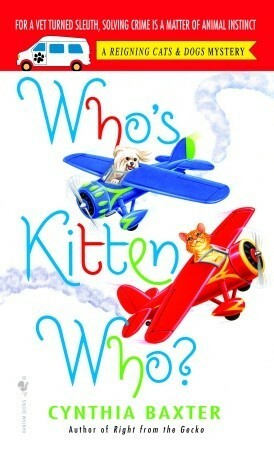 This is the sixth book in the Reigning Cats and Dogs Mystery series by Cynthia Baxter. 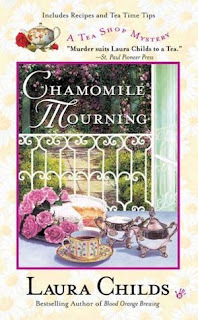 One of my latest book finds, Chamomile Mourning (2005), happens to be the sixth in the Tea Shop Mystery series by author Laura Childs. Set in Charleston, So. Carolina, the mystery is centered around the Indigo Tea Shop, its owner Theodosia Browning, her master tea blender Drayton Conneley, and her pastry chef and tea sandwich maker, Haley Parker. (The first names of the characters seem to conjure up old, historical Charleston). The book quickly immerses us in tea lore while also telling its story; Drayton, the tea connosieur, serves his customers unusual teas such as Royal Golden Yunnan, Dragonwell tea, Nilgiri tea, Chin Sun Oolong from Thailand, Mai Jiang green tea from China, African Redbush, Darjeeling, the "champagne of teas," and many more. Theo uses only the best for her tea- Crown Dorset, Spode, and willow-pattern teapots, for example- and serves pastries, savories, and light lunches at elegant tables with linen napkins, silverware, and fresh flowers. The plot thickens when she leaves the relative safety of her teashop to venture outside of Charleston to solve the murder of auction house owner, Roger Crispin, whose untimely death ruined her rose-decorated cake and the rest of the Poet's Tea at a local Heritage Society get-together. Theodosia interviews people in the backwoods, avoids being run off the road, and narrowly escapes death by bullet and by quicksand. She also finds a new love interest in this novel. The contrast of the teashop setting in Charleston and the wilderness and swamps of South Carolina adds some heady spice to the last part of the book. 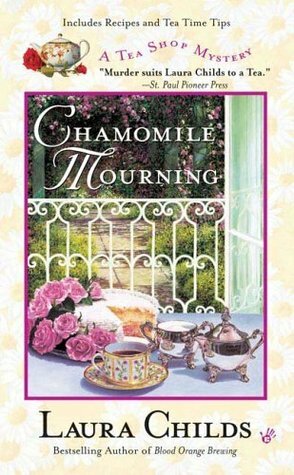 The pace of the novel picks up at the very end of the book and saves Chamomile Mourning from being just a novel about tea making, hatmaking, interior decorating, and frivolous fashion. Tea lovers, however, will have a good time reading about different varieties of tea and the foods they complement. They may also enjoy the book's bonus recipes for strawberry biscuits, cinnamon-apple scones, marmalade and cream cheese tea sandwiches, chocolate tea, and she-crab soup! 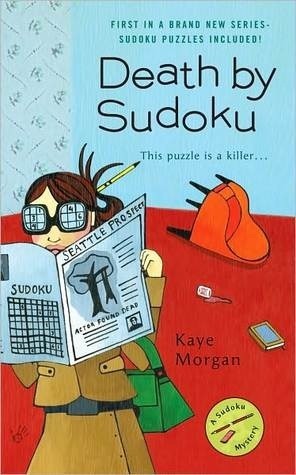 Seen at Barnes and Noble: the first in a new Sudoku Mystery Series by Kaye Morgan. Do we have inventive and savvy writers or what? Here are several mysteries with the sudoku theme, by different authors. I haven't read any of these as yet, but have them on my "To Check Out and Possibly Read" list. 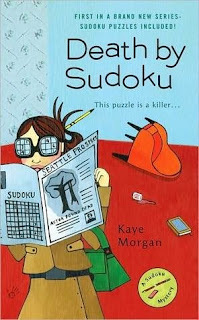 Death By Sudoku: A Sudoku Mystery by Kaye Morgan, July 2007. 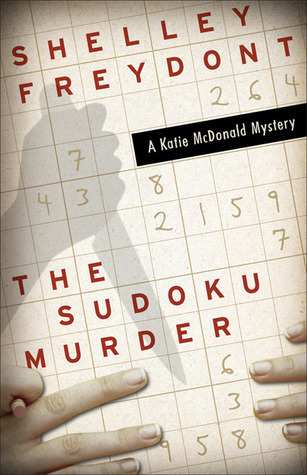 Murder By Numbers: A Sudoku Mystery by Kaye Morgan, January 2008. The Sudoku Murder: A Katie McDonald Mystery by Shelley Fredont, April 2007. The Sudoku Puzzle Murders: A Puzzle Lady Mystery by Parnell Hall, April 2008. 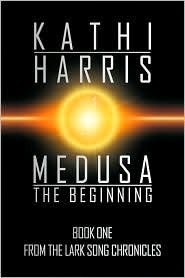 Kathi Harris's Medusa: The Beginning is a 730-page novel, divided into several sections, the first section set in the West Indian island of Jamaica, where Kathi was born and raised. Here she details the lives of two young people from the countryside who meet in the capital city, Kingston, where they marry and raise a family of five girls, the last girl later becoming the heroine of this science fiction novel. The first section, 221 pages, I would call "The Quintessential Jamaican Novel," were it a book in itself. 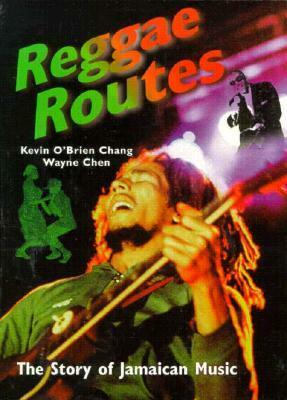 The story reflects Jamaican customs and manners in detail, and the dialect or patois spoken and understood by all Jamaicans is used heavily in this section. Kathi has added a glossary for all readers, which "translates" some of the dialect words and expressions into standard English. In the second section of the book, the family migrates to America and settles in Florida. There they encounter life and the culture of a different country, but more opportunities open up to them. This section deals with American politics at home and abroad and tackles global problems such as pollution, changes in the environment, and introduces in her novel, a Black president! Kathi's website, Larksong, gives a summary of the novel's plot and the importance of the young girl, Lark, to this sci-fi story of the survival of mankind. A higher education and counseling graduate from the University of Toledo, where she received her Ph.D., she admits she prefers writing to just about anything else and is now waiting to publish Book II in the Medusa series. Book provided by the author for my objective review. Sue Henry has branched out from her Alaska mysteries featuring dog musher Jessie Arnold, and has begun a new Maxie and Stretch series, featuring a retired widow and her miniature dachshund, Stretch. The widow, Maxie McNabb, spends the winters with Stretch motoring outside of Alaska, driving around the Lower Forty-Eight in her 30-foot motor home, spending a lot of time in the southwest. She solves mysteries in Taos and nearby locations in the first two books in the series, all while sightseeing and camping out in her motorhome. But the third book in the series is all about Maxie, without Stretch. 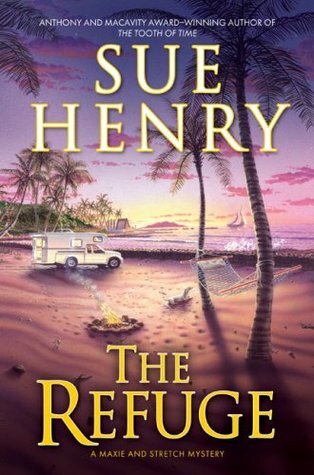 In The Refuge, Maxie leaves Stretch and her motor home in Alaska to fly to the Big Island, Hawaii, to help an old acquaintance, Karen Bailey, who has been injured in an accident and left with a cast on her leg. She needs Maxie's help to help her pack up and move back to Alaska, where she is from. There are myserious circumstances surrounding Karen and unexplained attempted break-ins to the house in Hilo, Hawaii when Maxie arrives there. There is a suspicious stranger lingering nearby the house, and later on, a search of the house that leaves packed boxes torn open and contents trashed. Maxie meets and hires a young man to help with the packing and shipping of her friend's belongings. Intending to work faster without having to take care of Karen too, she sends Karen on ahead to Alaska and works with the young man, Jerry, to finally ship and sell Karen's belongings. After the packing and shipping has been done, they rent a truck camper to tour the Big Island while they wait for Maxie's flight back to Alaska. But the mystery surrounding Karen follows them around the island, even as they visit tourist sights such as Hawaii's Volcanoes National Park, the park's Kulanaokuaiki Campground, the Chain of Craters road, and The Refuge, a place of cultural and historical significance, where the mystery comes to a head and Maxie and Jerry barely escape with their lives. The book's best quality is the description of the Big Island and the places you can visit and see with a truck camper. From this point of view, the plot is really just incidental. I chose the book because of the setting, and I wasn't disappointed in the virtual tour of Hawaii, with some mystery thrown in. Be led down the garden path in a pleasant way with Beverly Nichols' 1932 original book on country gardening. I found Down the Garden Path, a hardcover, at a library sale and got it for about 50 cents or so. It doesn't have the original jacket cover but was printed in 1932, when the author was in his 30s. Yes, Beverley Nichols is a "he", and of course, he's British. Who else but an English gardener would rhapsodize on every page about flowers and plants and pamper them to an extreme, to the extent of sheltering a foxglove with an umbrella during a particularly heavy rain (because, as he says, foxgloves don't like to be wet). 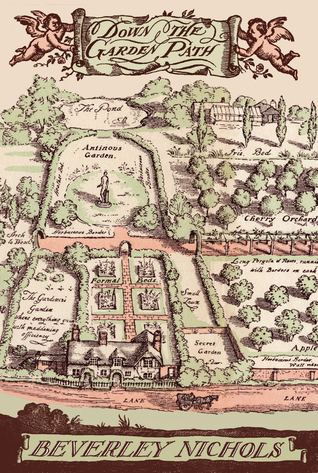 After buying a country cottage in the English countryside, Nichols proceeds to fill the garden with flowers and bushes, and goes on to plant a wood, build a great rock garden, dig a pond, and of course, hire a gardner. Nichols, in his gardening frenzy, competes with the neighbors, in particular a Mrs. M, who never fails to find fault with his landscaping and the health of his plants. He gets his revenge when he catches her red-handed, unearthing pots of flowers she had bought and planted in her garden, pots and all - the flowers she claimed to have grown from seeds bought in a "penny packet." Down the Garden Path is entertaining and informative, and at the end, Mr. Nichols promised to write many more books on gardening, and he did. He wrote this book in his 30s and he died in his 80s, so he had a lot of time to rhapsodize some more about the modernizing of his thatched cottage and the development of his extensive garden. At the beginning of the book, the author is determined to find flowers and plants and even trees that will flower in the dead of winter. He finds the winter aconite, the Christmas rose, mimosa, and others with Latin names he doesn't give us the common names for. I used Botanica, an Illustrated Book of 10,000 Garden Plants, to look up a few. Of course, the English climate is milder than ours and English gardens will have blooms in winter that we won't have here. Would you believe that Down the Garden Path is often reprinted, in hardcover! The original is illustrated with garden scenes of cupids, garden tools, and country landscapes, and I think the reprints also have these illustrations. This book was a lucky find at that library book sale! I can't believe I have a shishigashira in my backyard! I bought the unusual maple many years ago (it was expensive! and there were only two in the lot). It's now about 6 feet tall and trying to get taller. I took a close-up shot of its unusual leaves this spring. You can see the leaves curl one on top of the other and give the impression of a shaggy lion's mane. A few of the stems are showing new growth. The tree sits in a shady spot under a large overhanging oak, and only gets sun part of the day. But it seems to be thriving and is not at all straggly. 2009 Update: Recently, I found out that the tree should not sit in wet ground, but in well drained soil. Mine didn't do well in the heavy rains of spring 2009, and half of the tree died, with only the bottom branches showing leaves. I guess I'll have to trim it back later, but will wait to see how it recovers this spring. "After 125 years in cultivation, the famous Lion's Head Maple is still acknowledged as one of the best and most unique Japanese maple cultivars. It is a compact, slow-growing shrub, usually to around 6', though taller trees are possible with good cultivation. By 'compact', we mean that the leaves are closely packed on the twigs, and the twigs closely-packed on the branches. This leads to a tufted look: clusters of leaves alternating with leafless areas of branch. The leaves themselves are small, deep green, and crinkled, thickly textured. No wimpy sunburning here. The transition to fall color is like caterpillar to butterfly, with the deep reds and oranges completely changing the visual effect.This is a good tree for the landscape, container, or bonsai. The name is a reference to a mythical Japanese lion." This fledgling robin was hopping along on the ground under some hosta and daylily leaves, intermittently squawking. 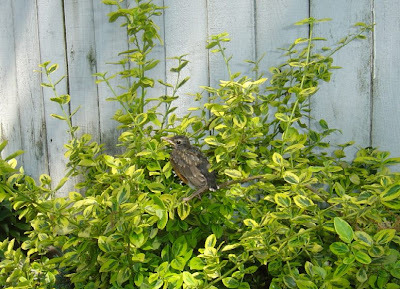 It tested its wings and made it a foot off the ground into this euonymus bush, which must have reminded it of its nest, as it calmed down and sat quietly. The young bird allowed me to get as close as a foot away to take this picture. Soon, an adult robin flew in and began a loud squawking, which the young chick answered. I left so that the adult bird could approach, but stayed close enough to continue watching. The parent landed on the ground and approached the bush, and the young bird hopped down to join her. It followed her as she gathered insects from the grass to feed it. Soon after being fed, the young robin flew through a gap in the fence into another yard, away from its parent. An hour later when I went back into the garden, two adult robins were squawking away on the wires overhead, with no answering call from the ground. One of the adults suddenly became quiet and I noticed the pachysandra leaves (a ground cover) around a maple tree rustling and waving in a straight line. A baby robin soon poked its head out from the greenery and eyed me curiously. I supposed it was not hungry as it made no effort to answer the adults. I've heard of newly hatched chicks bonding with the first living thing they saw after emerging from the shell. This bird had been out of the shell for some time, but I didn't want to take any chances, so I left just in case it decided it should follow me for food! When I checked later in the day, the yard was empty - no adult or baby birds within sight or hearing. I presume they all went together where birds go in the evenings to shelter for the night. I wrote this in 1999 on the web, one of my first attempts at reviewing a book online. I identified myself simply as "A reader." After seeing several articles by newspaper writers upset at web reviewers, I revisited my old posting, one of the first 10 or so of about 68 done by reviewers/readers at the same site on the mystery, Murder With Peacocks by Donna Andrews (1999). 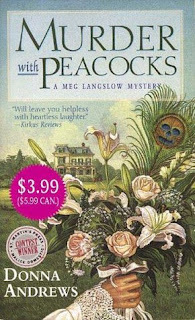 A comedy of manners with peacocks (brides) - and a mystery. A delightful heroine, Meg, overworked, has amazing energy to organize three weddings for difficult brides-to-be, one of whom is her mother. In spite of a murder here and there and near-fatal "accidents," Meg tries to organize everything from fittings for gowns to addressing hundreds of invitations and even "renting" peacocks for her brother's wedding. In between her hectic schedule, she tries to solve the murders as well, all the while hampered by demanding brides-to-be, relatives, an eccentric father and fatuous mother, and a host of zany characters. A fun book to read, as a mystery and as a comedy and good natured farce on weddings, their rituals, and the entanglements of a small town where almost everyone is related. Even the animals are fun - Duck, the Dog Spike, and of course, the peacocks. The unraveling of the mystery leaves some questions unanswered, but it's fun getting all the way to the end." Female mystery lovers who enjoy, or hate, weddings, you might enjoy reading this book. My early summer garden is visited by birds and lots of squirrels, but also by critters that take the heads off some of my flowers! In the garden early this morning, using new birding binoculars bought on International Migratory Bird Day at a local state park, I saw blue jays, robins with worms in their beaks, a cardinal preening on a really high television antenna, a young hawk, and a pigeon with its beige under-feathers ruffling in the wind. I heard lovely warblers but couldn't find them among the thick leaves of surrounding oaks. The migrating songbirds are miniature in comparison to the larger robins and blue jays that stay in this area all year round. In the garden, the rambling rosebush in the photo will be full of roses by the end of next week. The bleeding heart bush in the forefront has finished blooming, but the yellow-green ornamental euonymus bush behind it lasts all summer and into the winter. A hosta edged with yellow and a sedum plant peep out to the right of the bush. Here are my new efforts at digital photography! Hope you enjoy the yellow-green colors of my late spring garden! Seems newspaper book reviewers are angry with bloggers invading their territory and writing online book reviews or simply making comments online about books. Josh Getlin of the Los Angeles Times writes about the "Book Review Wars" and cites Michael Dirda, a Pulitzer Prize-winning book critic: "The book review section … remains the forum where new titles are taken seriously as works of art and argument, and not merely as opportunities for shallow grandstanding and overblown ranting." As a blogger who rants about books, shallowly or not, I wonder... if blogger comments are as bad as Dirda claims, then why should he be worried? Could it be he think readers are tired of the traditional book critic's own "grandstanding and overblown ranting" and want to hear more from people like themselves? In any case, people from the "lit blogosphere" have responded to Dirda and started a virtual war of words between the lit bloggers and the newspaper book reviewers - via the web, of course. Cara Black's mystery novels are each set in a different neighborhood of Paris. 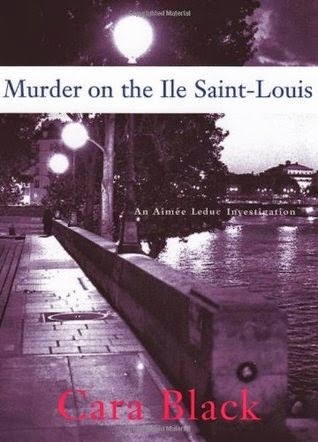 Her most recent in the series is Murder on the Ile Saint-Louis (2007).The main character in the series, Aimee Leduc, owns a detective agency with her business partner, Rene, a four-foot dwarf who is a computer whiz. They work mainly in computer security and together they provide systems administration, systems management, and computer security to businesses, government agencies, and whoever else can help pay their bills. In the novels, Aimee gets caught up in the lives of the Parisians in the different quarters of the city - the young and the old, immigrants and long time residents, people who remember the war and the lives changed by the war. As she solves crime after crime in the city, she also uncovers old secrets and ghosts, stories of guilt and grief, love and hope. Paris is steeped in history and its old buildings, even the underground sewers and tunnels, the river Seine, the cobbled streets all work their way into her interesting and original plots. I've read all the books in the series and have listed them all below as I was impressed with the story line, the characters, and the novels' strong sense of place. Cara Black lives in San Francisco but travels often to Paris. and is working on her next Aimee Leduc mystery, which is probably also set in Paris. The title of each of her previous novels indicate the area of the city in which her plot is centered: Murder in Montmartre (2006), Murder in Clichy, Murder in the Bastille, Murder in the Sentier (nominated for the Anthony Award, 2003), Murder in Belleville, and her first, Murder in the Marais (1999). The Art of Happiness: A Handbook for Living The Dalai Lama was in a light hearted mood on that warm and sunny afternoon in Chicago, when he spoke before a crowd of about 11,000 people who had bought lawn tickets to see, or rather hear him speak, at Millenium Park in Chicago on May 6. He joked about his meeting in the 1950s with Chairman Mao, who gave him "permission" to fly the Tibetan flag in a Chinese-occupied Tibet. He acknowledged that some of the crowd in the park were there to satisfy their curiousity about the Dalai Lama. He told them he was there to speak to them as a person, implying he was not addressing them as Tibet's 14th Manifestation of the Buddha, but as another man. The casual and light-hearted atmosphere of the day was evident too among some of the people there to protect him. The African-American city employee who was there to tell the crowd what they could and could not take into the park also gleefully announced, "No marijuana! The Dalai Lama does not want to smell marijuana!" When he focused on his topic, "Finding Inner Peace in a World Full of Turmoil." the Dalai Lama spoke of the need for compassion and for diluting anger by turning it into something more contemplative and analytical. Here's a Chicago lawyer's point of view. See the link below. 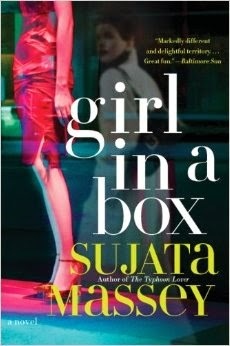 Try reading Sujata Massey, whose mystery series is set in modern Japan. Her most recent book, Girl in a Box, reveals the shopping culture and shopping habits of Japanese and expatriates alike, and the sales organization of ritzy Tokyo department stores. Of course, because this is a mystery novel about big business, the yakuza (gangsters) are involved in the plot, as are a shady American or two. The sales culture, the relationship between managers and staff, and staff and customers, all point to the enormous efforts made to please clients. On another note, there is a visit to a hot springs resort in the north, where the store managers go for a business conference, and so we also learn about public baths and bathing "etiquette." Other novels in the series delve into the world of Japanese arts, folk culture, antiques, and religion. We see Japan while following the exploits of the main character, Rei Shimura - English teacher, aficionada of Japanese folk arts, antiques dealer, and sometime spy. She is also a haafu (half Japanese), with close relatives in both Japan and America, which gives her insight into both cultures. She appears in The Flower Master, The Bride's Kimono, Zen Attitude, and The Typhoon Lover, among others written by Sujata Massey. Sujata Massey herself is part Indian and part German, but grew up in California. She spent many years in Japan teaching English and studying Japanese and says that, in Japan, she feels more at home than in India. Haruki Murakami's latest novel, After Dark, begins just before midnight in Tokyo and ends just before 7 a.m. The focus is Tokyo in the dead of night, after the trains have stopped running and the only public transportation out of the city is by cab. Some of the people left in the city are college students and office workers. They are in the bars, hanging out in all night restaurants, in game parlors, or working late in the office. 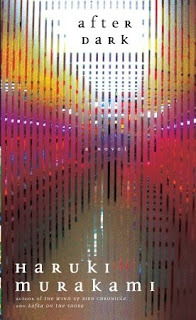 The book follows a young college student, Mari, who decides to stay reading in a Denny's restaurant rather than go home. She meets another college student there, a musician who is in the city to practice with his band. At his suggestion, Mari leaves the restaurant to help a foreign woman who has been injured, and in the course of events, comes across unusual situations and makes some unlikely friends, including the manager and maid of an all night hotel. Long conversations during the night with the musician, who has met her older sister, help her come to terms with the reason she has avoided going home. When morning arrives and the trains are running, Mari goes home to the suburbs, where she knows she will find her older sister, Eri Asai, still in a deep sleep. A beautiful and well-known model, Eri Asai has been sleeping steadily the past three weeks, getting up occasionally to eat, though no one has seen her when she is up. Remembering how protective Eri Asai had been of her when they had been trapped in an elevator as children, Mari tries to empathize with her sister, in tears hugging her as if willing her to wake up out of her long dream. There is a glimmer of a response. Mari finally goes to sleep. The novel only hints at the reason for Eri Asi's withdrawal. There is a suggestion that it involves the sinister office worker Shirakawa, whom Mari is unaware of though their paths overlap during the night in the city. The novel has many levels of meaning. Murakami reveals the flip side of the city, after dark, at times with humor. The city at night also reveals the dark aspect of some of the characters he explores. Mari and the musician walk about the city and among these people but remain unscathed. Submitted for the Lost in Translation Reading Challenge. and resubmitted for the 2012 Haruki Murakami Reading Challenge. I dined this weekend like an emperor, or just about. If it hadn't been for my allergy to fish, oysters and clams and some other kinds of seafood, and my sensitivity to tree nuts, I would have truly dined like an emperor. And if I had been able to speak fluent Cantonese, that would have clinched it. As it was, I had a fine Sunday dinner with my relatives, enjoying steamed chicken in a ginger, garlic, and green onion sauce; a chicken and mango fusion dish; beef slices with broccoli; squid and shrimp (which I can eat) over dry noodles, deep fried seasoned pork slices, and corn soup with shrimp. Being allergic, I had to bypass the fresh black cod steamed in garlic and ginger that the rest of my non-allergic family enjoyed. That was not too much to bear given the other dishes on the menu, however. For lunch every day, I had the same type of little dishes that were originally made for emperors. Today of course, the masses can enjoy the varied culinary delights we now know as dim sum. And I wasn't even in China, but in Markham, Ontario, part of the sprawling cosmopolitan city of Toronto, Canada. (Lest you think Toronto must be all Chinese, because of the food, let me assure you there is a Greektown, a Little Italy, and numerous other ethnic enclaves there). At dinner on another day, while my mother had a rice congee soup made with barbecue pork and oysters, I tried a chicken rice soup which was a little bitter because of the fruit, longan. The fragrant and sweet flesh of the longan surrounds a tree nut and has the same properties of the nut. In other words, I can't eat it. It also seemed to turn bitter when cooked. Another type of congee at a different restaurant had me pulling up short too, in a culinary sense. The chicken congee had two unusual ingredients added, one a white spongy fungus that I could eat, the other a long yellow noodle-like food that the waitress said came from the bottom of the ocean. As neither our waitress nor any of the restaurant staff could tell us in English what the food was, whether it was animal, plant, or fish, I put down my spoon once again. A final dim sum lunch the day before we left Toronto had me once again facing the seafood problem, of whether to eat or simply just taste the food. We were sharing a large table with a young man and some elderly Chinese who were companionably eating and chatting away in Cantonese. When the dim sum cart passed by with delicious looking black shitake mushrooms on a bed of greens, I was tempted to take a dish until I spotted what looked like nice fat grubs mixed in with the mushrooms. As I contemplated whether they were meat or fish, the younger gentleman at the table informed me that they were sea cucumbers and, as I hesitated to order them, he added, "Very good for lowering cholesterol." I was chicken however, and only watched as the elders at the table enjoyed the delicacy while I ate the everyday cholesterol-packed pork sui mai and my favorite, tripe in garlic. While I didn't eat everything there was to eat, I did taste most of it. And that is good enough for me, for now anyway. For those of you who teach, how would you rate yourself in the classroom? Effective, communicative, witty, clever, knowledgeable... innovative? How would your students rate you, however? And just how reliable are their evaluations? In "Hemlock Available in the Faculty Lounge, " (March 16, 2007, Chronicle of Higher Education), Thomas Cushman, in self-defense, shows how Socrates would rate as a teacher if he were evaluated by some of today's college students. "Teaching evaluations have become a permanent fixture in the academic environment. These instruments, through which students express their true feelings about classes and profes-sors, can make or break an instructor. What would students say if they had Socrates as a professor?" It's really quite funny. See the entire editorial below. In his new book, a doctor of Chinese medicine, Maoshing Ni of the Yo San University in Los Angeles, gives tips on how to stay healthy through proper diet and remedies, a proper environment, exercise, and "good relationships". 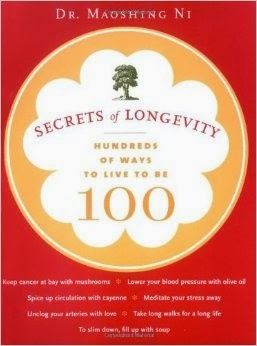 The Secrets of Longevity: Hundreds of Ways to Live to Be 100 is 305 pages long. There are approximately 290 "ways to live to be 100" listed in the book. Many of the tips are well known health facts, some are plain common sense, and others are based on traditional Chinese practices and herbal medicine. Some nutritional tips for living longer and staying healthy include eating foods such as tomatoes, mushrooms, pineapple and papaya, any red fruit, and using spices such as ginger and garlic. The book of course explains the specific health benefits of each fruit, spice, or vegetable and the health value of each bit of advice given, advice such as eating less protein and eating less at night than during the day, and so on. Another tip discusses the negative effects of pharmaceutical drugs. Some Chinese practices listed include avoiding raw foods in winter, doing Qigong deep breathing exercises - inhaling deeply and slowly to purify and calm - and more. Other suggestions from the book to keep you on the longevity road: close family ties and good relationships with your neighbors! By the way, Dr. Ni is the 38th generation in his family to practice Chinese medicine. Now that the snow has just about melted and spring is finally here, women (and men) can happily turn their thoughts to .... the garden, of course. Armchair gardners who would rather read about gardens than toil in one, however, can put themselves into imaginary gardens by reading the following cozies that blend horticulture and landscaping with a bit of mystery. 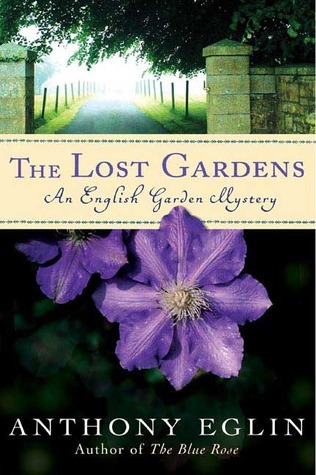 There is The Lost Gardens (English gardening mystery) by Anthony Eglin, Death in the Orchid Garden by Ann Ripley, and Deadly Nightshade by Mary Freeman. 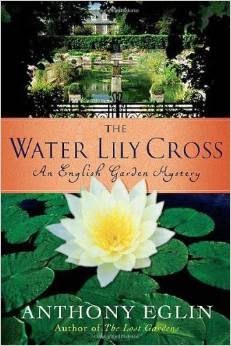 My favorite garden mystery writer is Ann Ripley, who sprinkles her early books with tips on plants and landscaping in the same way that author Diane Mott Davidson sprinkles her food catering mysteries with recipes. Their protaganists work hard at what they do - digging, planting, mulching or cooking, baking, and carting trays and platters of food around. Ripley has her main character working hardest in Mulch, when she goes out to collect bags and bags of raked up leaves that all her neighbors have set out on the curb at night for garbage pick. She wants to add the leaves to the mulch in her wooded back yard, you see. This gets her into some big trouble, but in a way you couldn't forsee. All the garden work you read about in Ripley's books will either make you tired or motivate you to start digging in your own backyard to plant bamboo or start a water garden. Other gardening mysteries I have just discovered are Michelle Wan's Deadly Slipper and The Orchid Shroud, and Heather Webber's Digging Up Trouble, not to mention J.S. 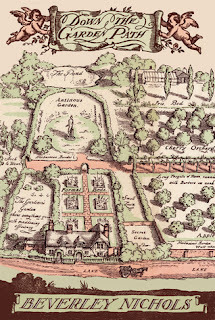 Borthwick's The Garden Plot, plus A Deadly Bouquet by Janis Harrison. I hope to enjoy some pleasant spring gardening... I mean, spring reading. Throw out books? That's a no-no, in my opinion. I donate books I don't want and will never read to the local library, which welcomes all books in almost any condition. If the books don't go on the shelves, they end up in a 50-cent or $5-a bag book sale and someone else gets to read them. Tear off the cover of a book and throw it into the recycling bin? Only if it's an old telephone directory! Here is someone I can sympathize with on everything except for the books he chooses to discard! His "slam-dunk discards" would be my lucky finds. Maybe we should start a book exchange? The editorial below appears in The Opinion Journal . The writer starts off with an interesting comment. "I was once told by an old graybeard (was he a teacher at school? an uncle in Madras? alas, I can't remember . . .) that a cultured man should have very few friends but very many books. I must have been a youngish mite at the time, for I feel that I've carried the imprint of those words for as long as I've been sentient." (Want to read more? The link to the full editorial is below). In the novels, the avidly anti-Castro father of the P.I. keeps a boat ready to return to Cuba at a moment's notice, at the first sign of "Cuba Libre," something he spends his life waiting for. On at least two occasions, Lupe uses his boat to sneak into Cuba, investigating lost or confiscated property, finding people, or recovering valuable artwork for her clients. Needless to say, her secret nighttime forays into Cuba provide some good suspense. I found out about mojitos (a drink made with mint leaves, sugar, soda water, and rum) and the Cuban American community in Florida while reading these lively mysteries. 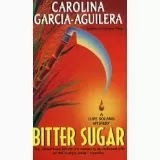 They include Bloody Waters (1996), A Miracle in Paradise (1999), Havana Heat(2000), and Bitter Sugar(2001). Mystery readers may already know there is at least one Birdwatcher Mystery series out there, one written by Christine Goff. Her latest paperback, Death Shoots a Birdie, ( Berkley Prime Crime Books, 2007) is about a group of birdwatchers (who else?) who travel from Colorado to a birding festival on the Georgia coast to see "prime habitat" for painted buntings, those flashy birds with red, blue, and yellow-green feathers. The birders discover the area is also home to a rare wooddpecker, and this of course, sets the stage for murder and mayhem. There are even alligators involved in the unfolding of this drama. Ms. Goff has written four other birdwatcher mysteries. The first was Death of a Songbird, which I also enjoyed reading, followed by A Rant of Ravens, A Nest in the Ashes, and Death Takes a Gander. Another mystery series involves birds of a different kind.<Murder with Peacocks, originally published as a hardback by Donna Andrews, won the Agatha Award for Best First Novel. It's one of the funniest books I've ever read, and I think it is her best. Since the plot revolves around a wedding, romance readers might enjoy it as well. Ms. Andrews' second book, Murder with Puffins, was somewhat disappointing. Her subsequent mysteries might be more rewarding. Her latest, The Penguin Who Knew Too Much, is doing much better. Now that spring is here, the birds have begun their morning songs and you might be curious, as I am, about which bird is making what call. But... can't see the birds for the trees? The two top suggestions by http://www.birdwatching.com/ for getting birdwatching binoculars are: Get the Best, and Try Them out First. I have a pair of powerful binoculars that I used the first time I ever went spring bird watching. I got marvelous details of leaves, but couldn't see the birds 10 feet in front of my face. They were just too powerful. Birds were flitting from branch to branch just above me, but I couldn't see them for all the leaves. My binoculars were good for watching objects very far away, like battleships, one outdoorsman informed me. A birder took pity on me when she saw my problem and loaned me her Steiner birding binoculars for a couple of minutes so I could ooh and aah over the sharp image of a small brown and white bird walking in a brook 15 feet away. With the birding binoculars, I could see the bird clearly even though it was almost camouflaged by brown twigs, brown leaves, and the mud of early spring water. The binoculars cost her a pretty penny, the birder told me, and the lens were made of crystal. (I looked Steiner up on the Internet and see they do have specially polished lenses). Anyway, good binoculars for bird watching cost from $300 to $1,000. So, if you buy the best, be prepared to empty your pockets! An ice storm has just passed; there is crystallized snow on the ground, about an inch or so of crunchy white. No Sunday morning sounds of dogs barking, children calling, or lawnmowers running. It's winter, not summer or fall, and evidently a day for couch potatoes. 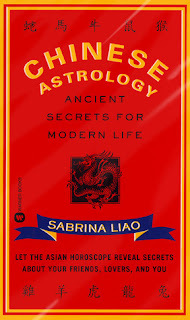 A good couch potato book is a paperback by Sabrina Liao titled Chinese Astrology: Ancient Secrets for Modern Life, by Sabrina Liao, printed in 2000. 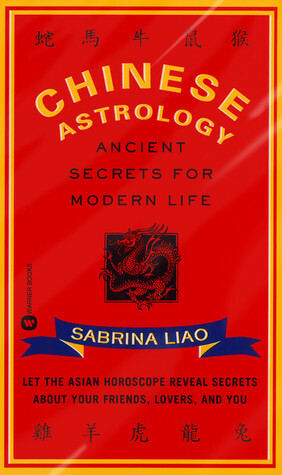 I am looking at some animal signs and descriptions assigned by Chinese astrology to people based on their year and date of birth. Here's Sabrina's interpretation of the best occupations for some of the animal signs, not in any order of importance. 1. Best Occupations for the Delicate Rabbit: accountant, antique dealer, art collector, interior decorator, tailor, politician, historian, diplomat, public relations executive. Also, lawyer, librarian, pharmacist, chemist, receptionist ( maybe not). Best Occupations for the Merry Monkey : movie star (Yes!) Bus driver, clerk, counselor, diplomat, foreign correspondent, politician, writer, town planner, nurse, theologian. Vocalist, judo instructor, stockbroker. (Maybe not). Best Occupations for the Gentle Sheep include novelist, painter, poet, potter, musician, investor, and landscape gardener. Best Occupations for the Enthusiastic Rooster include actor, travel writer, soldier, politician, critic, teacher, and dental surgeon. What about the Chivalrous Pig? He could be a musician, personnel manager, scientist, writer, restaurateur, or civil servant. I didn't include the 7 other animal signs out there. Oh, so you may be quoting someone freely, sprinkling your speech or writing with "famous" and even "overused" sayings? Using these quotes often in speech or writing, and maybe citing the sources too? What if some of your "quotable quotes" were never said? And what if others were not uttered by the person(s)you attribute them to? Evidently the public sometimes edits worthwhile sayings to make them even more memorable. Check out the Yale publication,"Yale Book of Quotations" edited by Fred Shapiro, and a New Yorker review of the book that also has some interesting comments on some hackneyed quotes such as "Give me liberty or give me death," "Play it again, Sam," and "Let them eat cake!" Who said what? Or, more importantly, who DIDN'T say what?